(Nanowerk Spotlight) Magnetic resonance imaging (MRI) is a powerful imaging technology that serves as a non-invasive method to render images of the inside of an object. It is primarily used in medical imaging to demonstrate pathological or other physiological alterations of living tissues. MRI also has uses outside of the medical field, for instance as a non-destructive testing method to characterize the quality of products such as produce and timber. Conventional MRI usually operates at the scale of millimeters to micrometers - 3 micrometers at best - which is good enough for the mostly medical diagnostic purposes it is used for. Researchers have now shown that the imaging of nuclear spins using magnetic resonance, the basis for MRI, can be pushed to sub-100nm resolution into the nanoscale realm. They demonstrated that using an emerging technique based on force detection, they can image nuclear spins with a sensitivity that is 60,000 times better than MRI. The resolution is about 30 times better than the most advanced conventional MRI imaging. By improving this technique, researchers will be able to push deeper into the nanometer regime and approach the capability needed for direct three-dimensional imaging of individual macromolecules. During an MRI scan, the nuclei of an object's hydrogen atoms align with the scanner's powerful, uniform magnetic field. Pulses of radio waves are then sent into the scanner that knock these hydrogen nuclei out of their normal position. After the radio wave pulsing stops, the nuclei realign back into proper position. During the realignment process, the nuclei send out signals. These signals are captured by the computer system that analyzes and translates them into an image of the object being scanned. As MRI increasingly finds applications in material and biological sciences, scientists are trying to find ways to overcome the sensitivity limitations of MRI and push the technology's resolution into the nanometer and, ultimately, the atomic scale. Magnetic resonance force microscopy (MRFM) seems to be the solution. "Our MRFM method measures a very tiny magnetic force between the nuclei in the sample and a nearby nanomagnet" John Mamin explains to Nanowerk. "Many types of common atoms, including hydrogen, fluorine, phosphorus, copper, aluminum, etc. have nuclei that are very weakly magnetic. Sometimes this basic magnetic property would be referred to as the nuclear 'spin'. MRI typically uses the magnetism of hydrogen nuclei contained in water. In our work, we are using the magnetism of fluorine nuclei contained in a small sample of calcium fluoride, though we can also use hydrogen." Mamin is a member of an IBM team at the company's Almaden Research center in California that succeeded for the first time in pushing nuclear magnetic resonance imaging below the 100 nanometer threshold. He is also first author of a recent paper in Nature Nanotechnology that describes these findings ("Nuclear magnetic resonance imaging with 90-nm resolution"). MRFM uses a magnetic tip and an ultrasensitive cantilever to sense the magnetic force generated between the tip and spins in a sample. 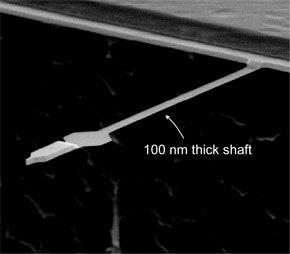 Unlike the permanent magnet tips previously used for MRFM detection of electron spin resonance, the tips used by the IBM researchers are based on a thin film of magnetic material that has a high magnetic moment, but is magnetically soft. "The tips we developed are compatible with sample-on cantilever experiments" says Mamin. 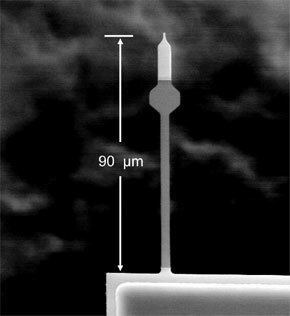 "In such an experiment, the sample is placed on the distal end of an ultrasensitive cantilever situated above the magnetic tip. By choosing the sample-on-cantilever configuration, rather than tip-on-cantilever, we eliminated the magnetic damping that occurs when a soft magnetic tip vibrates in the presence of an external magnetic field." Assuming the ultimate goal of single nucleus detection can someday be reached, the ability to image a molecule with atomic resolution would have a huge impact in structural biology, in particular the area of protein structure determination – an important and famously difficult problem – and would aid the development of new drugs. It could revolutionize the study of materials – ranging from proteins and pharmaceuticals to integrated circuits – for which a detailed understanding of the atomic structure is essential. Knowing the exact location of specific atoms within nanoelectronic structures, for example, would enhance designers' insight into manufacture and performance. The IBM team is motivated by the prospect of developing such a tool – the "holy grail" of molecular imaging – an instrument that is able to perform direct, three-dimensional imaging of complex structures such as molecules with atomic resolution. "Our detection limit of about 1000 nuclear spins is a significant step toward the goal of detecting a single nuclear spin" says Mamin. "The best conventional MRI requires at least 100 million nuclear spins to obtain a detectable signal. If we can achieve single spin detection in the future, this would open up the possibility of taking three-dimensional MRI images of the atoms in a molecule. Obviously, there is still considerable progress needed to extend our capability to the single spin level." While the present work is a demonstration of the progress researchers have made in increasing the sensitivity and resolution of magnetic resonance imaging, the important applications lie ahead, assuming of course that the sensitivity and resolution of MRFM can be further improved. Mamin points out that MRFM still has a long way to go to reach the ultimate goal, and much work remains in attacking the technical challenges along the way. "The main issues are related to the very tiny magnetic forces that must be detected" he says. "Better nanomagnetic tips are needed to generate stronger force signals, and noise reduction will also be key. There is still a lot of room for innovation in these areas."